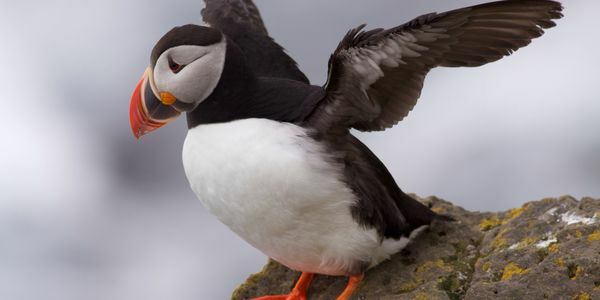 petition: Demand Puffins off the menu! Puffins are being hunted for dinner in Iceland! Puffins are small friendly birds, with no means to defend themselves against human hunts. They are being captured in nets! People are actually eating Puffins! Sign now to petition government to protect our Puffins and start a worldwide trend to take Puffins off the menu globally. All too often birds come under threat of extinction due to human interference and ignorance. We have lost over 140 bird species forever extinct in recent history, many species are added to the endangered list each and every year. Let's make sure our beautiful, friendly and totally harmless Puffins never have to suffer the dreaded extinction list caused by humans. Together we have the power to make a difference, together we can save our wildlife. Save our Puffins and get them "off the menu!" Sadly, overfishing and climate change have created food shortages, and the classic sight of a puffin loading its beak with row upon row of fish may soon be hard to come by. The species is now considered Vulnerable to extinction. Hunting season is from September 1st until April 25th. All species except the Puffins can be hunted during all this season. The active season for Puffins is only from April 15th until April 25th. During recent years, the large decline in the Puffin population in South and West Iceland, due to food shortage, have resulted in lack of birds for the pot. At Vestmannaeyjar, where traditionally the largest numbers of Puffins were taken not enough Puffins have been available, for the local households as well as two annual festivals. Nowadays, is not possible to harvest enough birds locally so hunters have to look elsewhere in Iceland. Puffins have greatly declined so that the local government has reduced hunting to a few days. For the past couple of years Puffin hunters from Vestmannaeyjar have visited Grimsey in July to harvest Puffins. This is only possible with the permission of local landowners and an agreement is reached on a fixed number of birds that can be harvested. Puffins lay only a single egg, in late April or early May. Both parents incubate it for 36-45 days, and they share the feeding duties until the chick is ready to fledge. Grimsey is divided into different harvest sites along the coast of the island depending on individual farms. The bird harvest is decided by the landowner. He can allow bird hunting or ban as he sees fit. To lure the Puffins by indicating no danger, some of the first caught birds are placed in an up-right position to imitate birds loafing in the colony. The catching of the Puffins is done using a triangle net attached to a 6-meter pole. The hunter selects a suitable spot in the Puffin colony where circling birds will fly close. While waiting for the birds, the hunter rests the net on the ground and tries to make himself as little visible for the passing birds. When a bird is within reach, the hunter raises the net swiftly catching the Puffin from the front. If the hunter is alone, he hauls in the net, relieves the entangled bird and wring its neck. The project Seabird Harvest in the North Atlantic supported by the Arctic Cooperation Programme of the Nordic Council of Ministers and NATA (North Atlantic Tourism Association). Thank you fellow Earth Advocates! We have reached over 1000 signatures and I am about to forward the details of this petition to the Minister for the Environment and Natural Resources in Iceland. Thank you everyone - I truly believe together, united we can save our precious Puffins from the dreaded extinction list.